The Top of Stair Extra Tall gate helps parents keep their children safe from common household dangers, especially around the stairs. The four point hardware mount combined with swing control provides a secure top of stair mounting that is easy to install with minimum tools required. 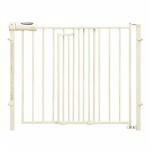 For your convenience, the gate will swing in one or both directions depending on how you set the swing control. A one handed release handle will allow you to pass through the gate quickly and easily, but the two motions to unlock the gate will be too difficult for baby. If your space is limited, don’t worry, because this gate will also retract as you open it. 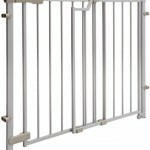 Q:Can this gate be lifted off when kids are not around, and placed back on when they visit? Yes. 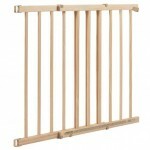 The brackets remain but the gate can be taken off very easily. 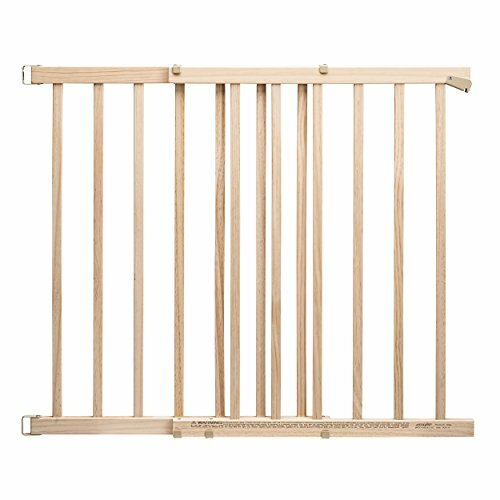 Q:Can this gate be used in a hallway (rather than top of stairs)? Q:The banister at the top of my stairs is metal…would it still work there or does it need to be screwed in on both sides? We did not screw it on even though we have a wood bannister. Bought a wooden plank that is about 1.5 inch thick and used industrial plastic ties to secure it to the bannister. The little metal clamps that come with the gate are screwed onto that. Plank and ties came from Home Depot. 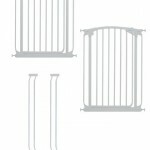 Q:what size opening does this gate fit? Q:what is the difference between wood and hardware mounted one? The photo and descriptions look rather similar. And the price is a bit different. Not exactly sure. But the Hardware mounted one, i own two of and had one at my old house too. The gate is made of wood, and then there are metal hinges and locking mechanism that are attached to the wood gate, and Both pieces mount to the wall/railing with metal hardware. 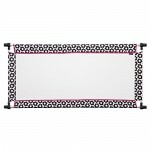 The gate can be quickly removed without uninstalling the hardware from the wall, and it just slides right back in. If the wood mounted one have wood mounts, i would say its not as sturdy/rugged, but i can’t say for sure since i haven’t seen it. Q:When gate is opened do you have to step over it? Q:How big are the openings between the rails? I have small cats that I want to keep out..
Approx. 3 inches. I think kittens would be able to squeeze through. Q:Can this gate be stained? I am pretty sure it can be stained. Q:Can you install this gate at an angle? Not unless you angled the receiving part of the latch the same as the gate. (Putting a piece of wood under it or something.) Not sure it’s the best gate for an angle but I could be wrong.